I love to dance. Going out to bars is pretty meh. But going out dancing – that’s another thing entirely! Because dancing, when you think about it, is an absurd activity. You go to an overcrowded location with a few people you know and a ton of people you don’t know, and wiggle your body until you can’t anymore. I mean, that’s just silly. 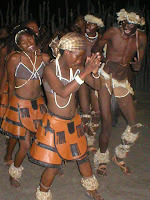 But every culture has some kind of dance...so it must be essential on some very basic level. 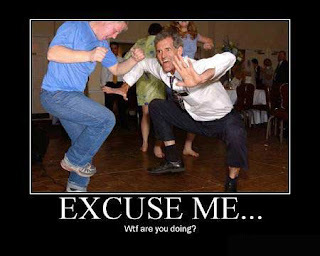 And I think most people can agree that dancing is totally awesome! You wouldn’t dance at work, you wouldn’t dance walking down the street, most people wouldn’t dance in public at all, except for those occasions when you go out dancing – then it’s totally legit and anything goes! And I also have this theory that dancing is good for running. They’re not that dissimilar – when I finish a good run, I may or may not sing along with my ipod while I walk my cool-down. Runners high = dancers high? (I’m totally making this up, but I really do think there’s a parallel there!) 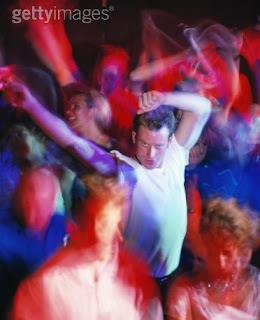 It’s all about using your body to express music, whether that’s Born to Run, The Distance, or In Da Club. Often after a hard workout, all you want to do is lie on the couch and not move…which feels awesome…until you have to move again. Then the soreness/fatigue/stifffness kicks in, and we all know that’s just a bummer. So next time you do a hard workout on a Friday or Saturday (or really any day, I won’t limit you! ), resist the urge to get cozy on your couch. Instead, set your DVR to record the Olympics, and go out dancing! It uses your muscles in a different way, shakes them out, gets your blood moving, and is FUN! I promise, you’ll be less sore the next day, AND a happier person.